Pothos is a completely open source framework from the API, to the GUI, to the available toolkits. Pothos is freely available under a permissive license to be used in a variety of open source projects, and for private or commercial uses. Read more about the available features on the Pothos features summary page. GitHub is an excellent tool for sharing and collaborting on open-source projects. Find the source code, documentation, wikis, tutorials, issue tracker all on the Pothos project homepage. Find demonstrations and tutorials on the Pothos Youtube channel. We can work with your team to help tackle design issues. Contact us about co-development. Interested in integrating an algorithm in Pothos, interoperating with specialized SoC hardware, offloading processing onto an FPGA or DSP, optimizing performance of a custom design? We have intimate knowledge of the framework, and integration experience with hardware and 3rd party libraries. 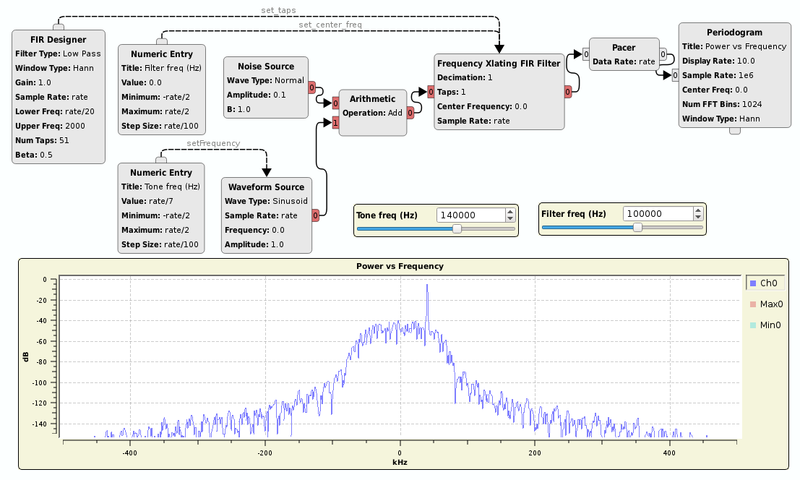 Power your SDR device with Pothos. Inspire your customers with the full-featured graphical design utility, an extensible API for creating custom IP, and diverse set of supported processing toolkits. Learn more at the Pothos SoapySDR toolkit page. Pothos is a dynamic and flexible framework, and we strive to handle as many use-cases as possible. If your application requires an additional framework-level feature, graphical tool improvement, or general design suggestion; please contact us about your needs. The Pothos project began in late 2013 with the goal of creating an open source data-flow framework. The framework should have an easy to use API, full-featured graphical interface, and integrate well with computational offload, SoC, DMA devices. We give the software away for free and make it available under a commercially friendly license. The business is sustained through contract services and a genuine passion about what we are doing. Josh Blum is the owner of Pothosware and the primary developer of the Pothos framework. He has over 10 years of experience in data-flow and parallel processing architectures, and extensive experience in SDR, FPGA, and DSP development. We also run a chat on #pothos on freenode.net for help, discussions, and issue tracker integration. Its takes a lot of volunteer effort to maintain the software projects and packaging needed for Pothos and SoapySDR. If you appreciate the effort, or are using this software commercially, please consider donating with the PayPal link below.